Each security blanket (issie™) is made from Aden + Anais signature fabric  natural cotton muslin  and lined with an ample strip of soft satin. Muslin is breathable, and the fabrics light, open weave construction allows liberal airflow that helps prevent overheating. Measuring 16x16 inches, the issie™ is designed to be portable and the ideal size for cuddling. 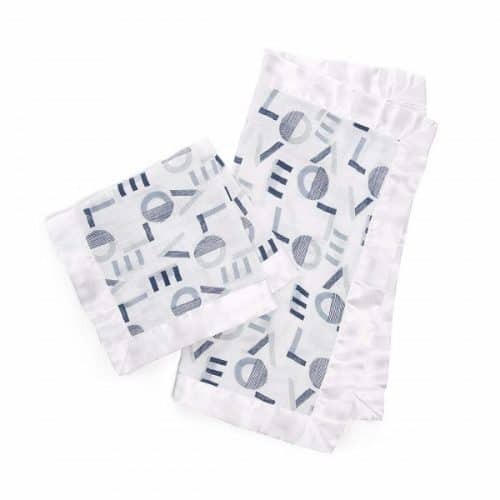 Each pack contains two identical blankets, so there is always one available for snuggling while the other is in the wash. Playfully designed in our exclusive, modern prints, the issie™ is available in several different patterns.